A step-by-step guide on how to become an electrician. Step 1: Is being a electrician for me? Is being an electrician for me? Are electricians happy with their careers? Still unsure if becoming an electrician is the right career path? Take the free CareerExplorer test to find out if this career is in your top matches. Perhaps you are well-suited to become an electrician or another similar career! While in high school, future electricians can lay a foundation for their career by taking courses that expose them to the principles of electricity. Algebra and trigonometry are maths that electricians use to measure wiring lengths, determine circuit angles, and calculate the force of an electrical current. Classes in physics, English, workshop, and mechanical drawing are also relevant to the electrical trade. If possible, seek out opportunities to work with an electrician as a summer helper or to volunteer for organizations like Habitat for Humanity. Most four- to five- year electrical apprenticeships are composed of between 576 and 1,000 hours of classroom instruction and between 8,000 and 10,000 hours of on-the-job training with an experienced electrician. Credits earned in a certificate or Associate’s Degree program may be applied to the classroom requirement, which includes blueprint reading, safety, mathematics, and electrical theory. The hands-on component comprises drilling holes, testing wires and switches, and installing conduit according to the National Electrical Code (NEC) and jurisdictional regulations. The IBEW and the NECA conduct their programs through the National Joint Apprenticeship Training Committee. To search for a sponsored apprenticeship, consult the Office of Apprenticeships Sponsors website. In addition to passing a job interview, apprentice applicants need to take and pass a basic aptitude exam, which tests reading comprehension and ability to perform simple math and first-year algebra. In most cases, candidates must also meet specific physical requirements, pass a drug test, and be able to demonstrate a certain level of mechanical aptitude. Some states require electrical apprentices to register before receiving permission to work on job sites. Some states issue different licenses for specific areas like residential/commercial, specialty installations, and industrial electric. Learn more about how to get a journeyman electrician license in your region..
With a journeyman electrician license, you are ready to work on residential and commercial electrical wiring, installations, and repairs. You will be able to complete tasks without direct supervision of every assignment. Electrical codes and jurisdictional regulations change. For this reason, continuing education and periodic license renewal will be a part of your career, to ensure you remain up-to-date. As you accumulate hours of experience on your way to becoming a master electrician, you may choose to take additional steps to qualify for one or more specialty licenses. Obtaining these credentials involves specific further education and experience, as well as passing a licensing exam. Based on our pool of users, Electricians tend to be predominately investigative people. And we should all be grateful for that! Because without the professionally trained eyes of these trade professionals, our safety – in our homes, at our places of work, and everywhere – would be at risk. Many practising electricians were drawn to the field because the skilled work allows them to use both their hands and their minds. The following required skills are evidence of this. Physical strength and stamina For the most part, electricians work on their feet and they often have to crawl through tight spaces and lift heavy mechanisms. Excellent eyesight Manipulating wires and tiny components and distinguishing between subtle colors to ensure proper wiring and safety demands excellent eyesight. Critical thinking and attention to detail Electricians are consistently called upon to consider reasons why an electrical component is not working. The reason, of course, is not always evident. Determining the answer takes a critical and detailed approach to solving problems. Teamwork, communication, and customer service While it is true that electricians often work alone, they may also work in teams, especially when designing and installing electrical systems for new residential or commercial projects. They must be able to effectively communicate and collaborate with colleagues, construction crews, and homeowners. Numeracy and technical ability Electricians must be comfortable working with numbers and interpreting technical plans. 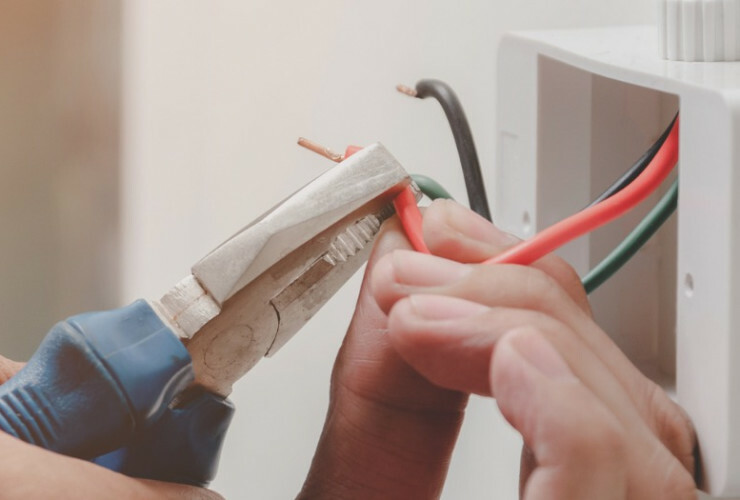 While pre-training at a trade or vocational school is highly recommended, the process of becoming an electrician is centered on an electrical apprenticeship. The path to becoming an electrician starts in high school, when students aspiring to enter the field typically lay a career foundation by taking courses in math, physics, and technical sciences such as electronics. Increasingly, the first part of formal education for prospective electricians is training at a trade school or vocational college. Diploma, certificate, and Associate Degree programs allow students to learn the fundamentals of the trade and prepare them for the apprenticeship application process. Programs typically focus on the National Electric Code, workplace safety, and electric theory; as well as provide some hands-on training. At the heart of learning to become an electrician is an electrical apprenticeship. During this four-to-five year period, apprentices participate in both classroom and on-the-job training in the various aspects of the electrical trade. They are overseen by a master electrician and directly supervised by a journeyman electrician. 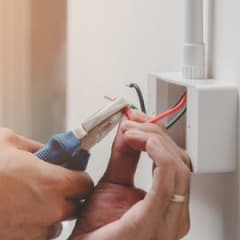 Master electricians are those who have already passed through both the apprentice stage and journeyman positions, and have exhibited a high degree of technical skill in the trade. A journeyman electrician has completed apprenticeship, but has not yet gained the skills or experience necessary to become a master. With the guidance of these professionals, apprentices learn how to read blueprints and technical diagrams relating to electrical plans, as well as how to install, maintain, and repair electrical wiring, lighting fixtures, electricity-distribution equipment, and control systems. They also become familiar with the National Electric Code and state and local regulations concerning residential, commercial, and industrial buildings. After becoming a journeyman, an electrician is permitted to work on most types of electrical systems, but is usually barred from the design of those systems. Restrictions vary by city, state, and country of residence. In most cases, electricians must be licensed in the state or local area in which they work. The majority of jurisdictions stipulate that applicants have a certain number of years of experience and pass an examination. Journeyman and master electricians are subject to different licensure requirements.